Are parts 43895-87B and 43895-00 the same? Interchangeable? My parts book says 43895-00 is the front axle for the cast wheel and the front axle for the laced wheel too. 43895-87B is not in my book. I think in 2000 is when Sportsters went to sealed front wheel bearings. Read through the Sportsterpedia section on front wheels. 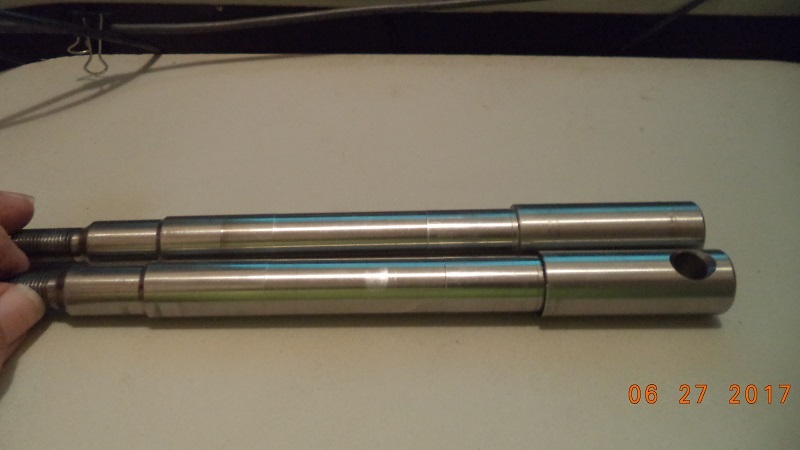 Last edited by Graywolf; 15th September 2018 at 16:17..
2000 style axle has a longer shaft area but they both are same overall length. This is in the 'additional information' under each part number in the chart. 43895-87B is in back, 43895-00 in front in this pic. Thanks, I am currently running an early 9's cast where and 2000 brake caliper on 2000 forks. Using a 99 axle.fits ok but had to shim brake calipers (dual disk with some washers to space them out to fit the old run and rotor setup. Have a line on a cast 2000 black rim thinking it may be better to use the newer rim but I need to figure out exactly I will need to buy to complete the swap. If the parts are even still available. Scroll down on the wheel chart. click on each letter to link to the pertinent bearing, hub and wheel spacer and axle part numbers for that wheel.